Nonfiction Monday is happening on Tuesday. I've been so involved with the huge weeding project at my library (we're changing our checkout system to RFID and are under orders to trim our collection of books. Which will make it easier for us to tag all of our books with the RFID tag. But I digress. ), that I forgot to grab a book to take home to review. Anywho -- here's one I found today. This is part of Harper's Let's-Read-And-Find-Out Science series. (Level 1) You may remember that for years and years (and even more years) that series consisted of books written by Dr. Franklyn M. Branley. It looks as if HarperCollins is now assigning a group of other writers to update the series. You know how Amazon.com has this "Look Inside" where you can click and see 4 parts of any book? Well, if you go to the HarperCollins website here, you can read the whole book and see all the pictures. Just click on "Browse Inside." In simple sentences, a few on a page, the writer takes you from fog on the ground to all the various clouds in the sky. I don't call this "easy reading" because how can cloud names like Cirrostratus and Cumulonimulus be easy to read? But students will be able to sound them out (with a little help from adults) and will enjoy knowing their true names -- just like they easily learn anything about dinosaurs, including those complicated names. 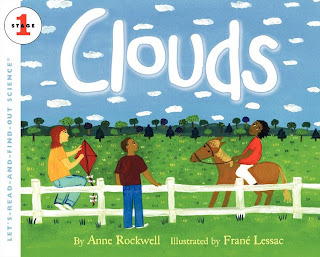 I especially like the illustration that shows ALL of the different types of clouds. And the fact that it repeats itself three times, as the words talk about the high, middle layer, and then the low hanging clouds. By the third time it appears, both child and adult readers begin to recognize each cloud type. What if there were NO clouds? Now, there's a viewpoint I hadn't thought of. Rockwell does, though, and discusses the fact that life, as we know it, wouldn't exist on earth without clouds to bring shade and rain. The rest of the Nonfiction Monday book reviews are located here. Thank you so much for this perceptive review of CLOUDS. I saw no way around the latin names, and it struck me that many children would find them fun to learn, just like those formidable dinosaur names. So you can imagine how pleased I was that you got out of the book just what I hoped would be there! This looks like a great book on a topic that fascinates kids and adults. I always like when an author uses the correct terms even if the vocabulary is "advanced". It shows their respect for the intelligence of children. I now know all the games to the fluffy, whispy, gnarly clouds floating above.